Cesar Sayoc Jr., 56, has been identified as the suspect in connection with mail bombs sent to several high-ranking Democrats and critics of President Donald Trump this week. Public records show that Sayoc has previously been arrested on charges including battery and shoplifting. Authorities could be seen on Friday towing a white van covered in bumper stickers expressing support for Trump and Republican causes. 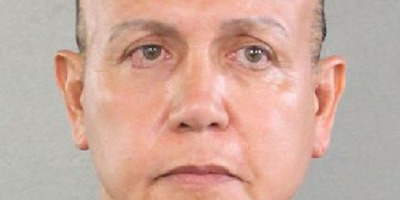 The Florida man arrested in connection with the explosives sent in the mail this week to several high-ranking Democrats and critics of President Donald Trump has been identified by law-enforcement officials as Cesar Sayoc Jr., 56. Here’s what we know about the suspect so far. Public records show that Sayoc has been registered as a Republican in Florida since at least March 2016 and that he voted in the 2016 presidential election. 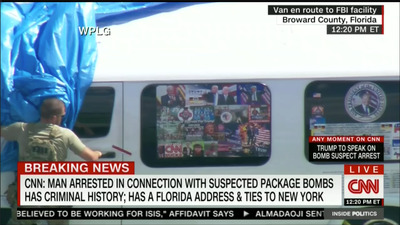 Shortly after Sayoc was arrested on Friday morning in Plantation, Florida, multiple news outlets reported that he had ties to New York, where authorities found several of the mail bombs this week. Public records list a previous residence for Sayoc at an address in the Brooklyn neighbourhood of Mill Basin in 1987. Sayoc’s criminal history goes back to June 1992, when he was arrested in Florida, though the charges were not specified. In subsequent years, he was arrested at least 10 other times, in North Carolina and Florida. Most of the charges are petty crimes like shoplifting, but he has previously been charged with battery and illegally possessing anabolic steroids. Perhaps the most troubling arrest was in 2002, when he threatened to blow up a utility company for turning his electricity off. Ronald S. Lowry, Sayoc’s longtime attorney, told the network that he doesn’t believe his former client ever intended to actually follow through on the threat. Lowry says Sayoc was sentenced to one year on probation. Sayoc’s record also shows several traffic infractions. Law-enforcement officials have not confirmed whether the vehicle belongs to Sayoc. 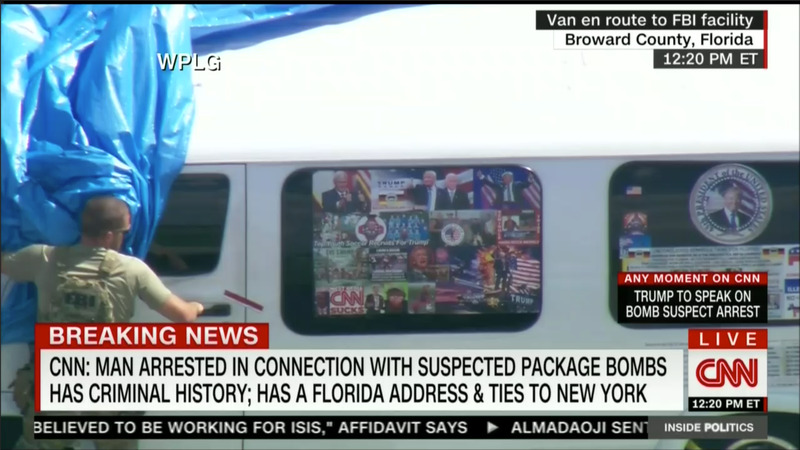 A law enforcement official told CNN that Sayoc had been living in his van at the time of his arrest, after being kicked out of his parents’ home. A 2012 bankruptcy petition, viewed by the New York Times, also shows that he was living with his mum and had no furniture when he went broke. It’s unclear if that van is the one that law enforcement agents towed in Plantation, Florida on Friday. A Twitter profile using his first and middle name surfaced on Friday. Pictures posted by the account appear to match his mugshot, and a photo of bumper stickers on a vehicle appears to match the ones on the van towed on Friday. Several posts express support for Trump and the Republican Party and criticism of Democratic candidates and donors, as well as news outlets. A woman on Twitter said that Sayoc had threatened her life on the website. A Facebook spokesman told CNN that several of Sayoc’s posts on the social networking site have been reported for violating community standards in the past, and subsequently removed. Some of those removals were done after Facebook users complained, while others were found through Facebook’s own detection system, the spokesperson said. The company did not detail how many posts were removed or go into details about the nature of the posts. Sayoc appears to claim Seminole heritage. Public records also show that Sayoc is the president of “Proud Native American One Low Price Drycleaning Inc.” and the manager of “Native American Catering and Vending,” both based in Hallandale Beach, Florida. The Seminole Tribe of Florida, one of the three federally recognised Seminole tribes, said in a statement on Friday that it had found no evidence that Sayoc had ever been a member or employee. A spokesman for the University of North Carolina at Charlotte told the New York Times that a man with the same name attended the school for one academic year, between 1983 and 1984. The university is now looking into whether they have any records on his behaviour from that time. At a press conference on Friday afternoon, FBI Director Chris Wray said investigators were able to confirm that a fingerprint found on one of the packages sent to Rep. Maxine Waters was Sayoc’s. Law-enforcement officials also told CNN that Sayoc’s mobile phone was tracked before his arrest. Attorney General Jeff Sessions announced Friday that Sayoc faced five federal charges: interstate transportation of an explosive, illegal mailing of explosives, threats against former presidents and other persons, threatening interstate communications, and assaulting current and former federal officers.